FreshStop, named International Convenience Retailer of the Year 2013, is South Africa’s fastest growing 24-hour convenience store brand. FreshStop stores are located at over 300 Caltex forecourts countrywide and feature a variety of innovative departments and products that focuses on the ever-increasing, time conscious demands of consumers. Customers are able to choose from a wide selection of daily essentials, freshly-baked products, fruit and vegetables including salads and fresh dairy products. Some stores provide a hot foods department as well as a delicious coffee offering of either Seattle Coffee Company or Lavazza Coffee. Collect 1.75% back in rewards points on all purchases at FreshStop capped at R150 per transaction. 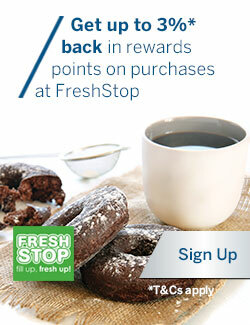 You can redeem your rewards points in-store at any FreshStop with your activated Business Rewards Card. Simply swipe your Business Rewards Card and enter your selected PIN. If you don’t have enough rewards points to pay for your purchase in full, you can use your Standard Bank Business Credit, Cheque or Debit Card to pay the difference. on 0860 UCOUNT (82 68 68). The total earn cap is limited to a maximum of R100 (1000 Points) per fixed cycle (i.e. from the 16th of the month to the 15th of the following month). Rewards Points will only be collected on the new rate at FreshStop provided the Card is in your name and the monthly subscription fee is paid by debit order from your Standard Bank personal current account, transactional savings account or credit card. The UCount Rewards membership must be active when the FreshStop purchase is made.